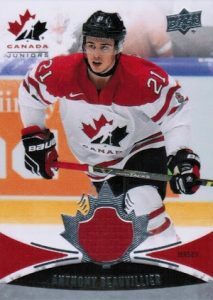 The newest additions to the hockey powerhouse, 2016 Upper Deck Team Canada Juniors Hockey documents the young names to take the ice for Team Canada. Each box features four total hits. 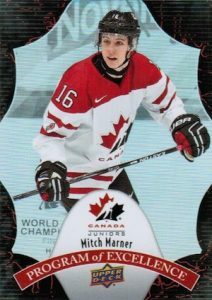 Collectors can find a 162-card base set that highlights the key options in the program like Mitch Marner and Dylan Strome. In addition, Gold (1:3 packs), Exclusives (#/175), High Gloss (#/25), and Printing Plates (1/1) comprise the limited parallels. 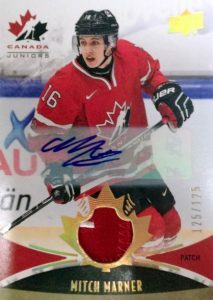 2016 Upper Deck Team Canada Juniors Hockey are plentiful with four per box. Although this is a decrease from last year, which offered six hits, there are still many options available. Signed standouts include Maple Leaf Forever Die-Cuts that come as Autographs, Gold Sleeve Patches and Logo Swatch (1/1) parallels. 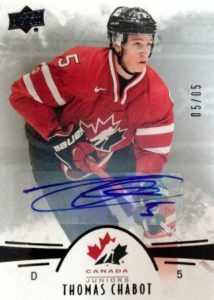 There are also Base Black Autograph parallels and Team Canada Men's Autograph Patches. Although the young stars are the focus, collectors can also find limited autographs for former players to pass though the program like Wayne Gretzky and Mario Lemieux. 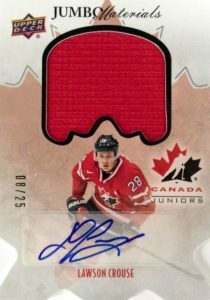 Relics in 2016 Upper Deck Team Canada Juniors Hockey extend to both game-used memorabilia and Manufactured Logo Patch cards. 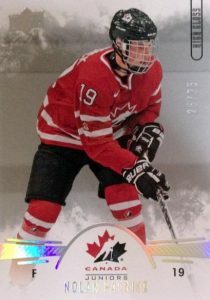 In addition to Canada Men's Jersey and Women's Jerseys and Patches, there are Team Canada Duos and Team Canada Quads Materials that feature multi-relic inclusions. Local Legend Relics and Jumbo Materials increase the relic totals. Likely a popular pull, Jumbo Materials Premium parallels actually spell out CANADA. There are also rare signed versions for many of the relics. 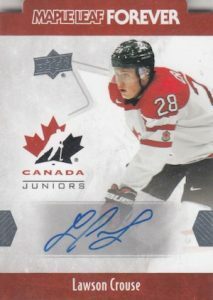 All 2016 Upper Deck Team Canada Juniors Hockey autographs are live in packs with no redemptions. 62 cards. Overall Odds: Men's - 1:16, Women's - 1:32. PARALLEL CARDS: Men’s - Gold #/30 or less; Women’s - Gold #/39 or less, Gold Spectrum Patch #/49 or #/25. 82 cards. Overall Odds: Women - 1:48; Men - #/5. 18 cards. Serial Numbered #/75. PARALLEL CARDS: Autograph #/25, Premium #/10, Premium Autograph #/5. PARALLEL CARDS: Gold #/25, Gold Spectrum Patch #/5. PARALLEL CARDS: 100 Years - 1:25; Vintage - 1:400; Rare Vintage - 1:1,000; Green - 1:5,700. 41 cards. Serial Numbered #/3. PARALLEL CARDS: Patch Logo 1/1. All subjects not found in Logo parallel. View specific options with the full spreadsheet. 21 cards. Specific group odds noted below. PARALLEL CARDS: Sleeve Patch #/3, Logo Patch 1/1. PARALLEL CARDS: Gold Spectrum Patch #/5, Black Tag #/2. PARALLEL CARDS: Gold Spectrum Patch #/3, Black Tag 1/1. PARALLEL CARDS: Rainbow Gold - 1:48 packs. OVERALL ODDS: Men's U20 - 1:76; Men's U18 - 1:76; Legends - 1:192. This is a highly underrated product with the main focus being recent junior players but there is a surprising (and refreshing because they are only on the map once every 4 years) contingent of women’s team cards. The two boxes of this stuff that I bought yielded 3 hits from the women’s team, including an auto. The legends hits are insanely difficult pulls but that is not the focus of this set. The drawbacks for this set are sticker autos (I hate these!!!) and the men’s gold spectrum auto patch set (/199 or /125) – these are not patches, they are heat pressed. I got 2 of these (1 from each box) and one has a 4 colour “patch”! 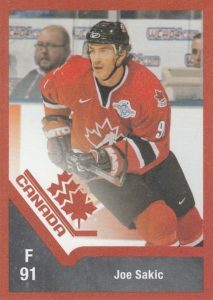 Team Canada jerseys only have 3 colours but one of mine has a small brown ‘line’ separating the white jersey portion from a piece of black“patch”. Oh well, at least I got a decent prospect (Comtois) and an Oiler draftee (Skinner). Overall, if you like prospecting and/or a Women’s team collector, this is definitely for you. If you are looking for legends hits, those are long odds and you’re probably better off buying on the secondary market. It is in line with other year’s UD TC products when it comes to hits, generally 2 jersey/patch cards plus 2 autos (one of which will be an additional patch) and a handful of #’d parallels – you should be pleasantly surprised when breaking a box or 2 of this stuff!!! 2014-15 Upper Deck Team Canada Juniors Hockey Hobby Box CONNOR MCDAVID auto?